Pros: Great SSD storage and performance. Large 1080p screen. Good performance for everyday home/office computing tasks. Has a variety of connectivity options. Cons: Non-touchscreen and poor viewing angles. Lacks backlit keyboard. Every so often we need our laptop to do more, to be super productive, whether it be for work or other general tasks. Even if you’re looking for a laptop purely for entertainment, you'll want one that performs to it's best potential. After all, in today's modern world we live a fast-paced life and so we need a laptop that will keep up with us. The ASUS F556UA-AS54 laptop was designed for speed and portability. This combination provides excellent features to ensure it keeps up with our needs. Whether you’re using this laptop to power through your project, or want to catch up with the latest in TV shows or movies, you can be sure this laptop will work for you. As far as design is concerned, this laptop appears very attractive and looks premium with it's brushed aluminum look, even though the body is actually made of plastic. We like the light gold, metallic-looking color but it may attract fingerprints easily. The bezels and bottom of the laptop are matte-black plastic. Although the laptop is made of plastic, it feels sturdy overall. * 2.3GHz Intel Core i5 6200U Dual-Core Processor. * Intel HD Graphics 520. * 15.6 inch Full HD (1080p) screen. * 1 x USB 3.0, 1 x USB 2.0, 1 x USB Type-C, 1 x HDMI and 1 x LAN port. * Inbuilt memory card reader, VGA camera and Optical drive. Performance - ASUS F556UA-AS54 features an energy efficient Intel i5 6200U processor based on 14nm Skylake MicroArchitecture. This is the same processor found in the HP 15-AY011NR which we recently reviewed. This processor is quite popular in mid range laptops. It features 2 Physical Cores (4 Logical) clocked at 2.3GHz which can go up to 2.8GHz. It supports many Intel based technologies such as HyperThreading, Turbo Boost 2.0 and Virtualization for various performance improvements. Whilst it may not be the first choice for playing games, the laptop can handle a mix of various multimedia and productivity applications. However, once you open too many tabs or applications on the web browser the laptop may have difficulty keeping up. It works well with Microsoft products allowing you to complete any project or task you take on. While it can’t keep up as well as other high specification laptops, it provides a good overall performance and allows you to focus on any typical home and small office tasks. 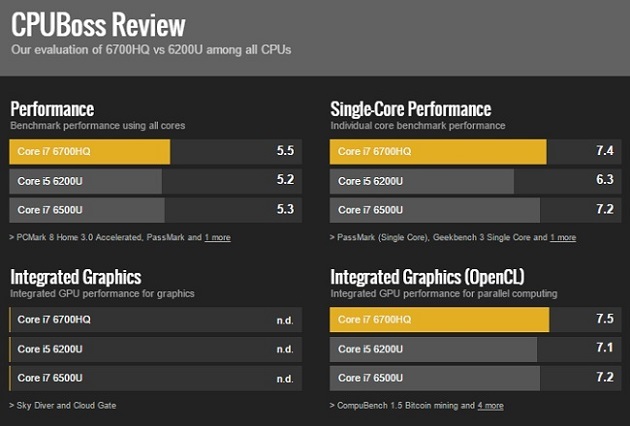 Users requiring more power should take a look at the Intel Core i7 version of this laptop - ASUS F556UA-EB71, which comes with a slightly more powerful Intel Core i7-6500U processor (benchmark below - courtesy CPUBoss) but without the performance improvements offered by a SSD drive. Overall, the laptop responds fairly quickly and smoothly and for most parts, users should not encounter any issues. Storage & Memory - The laptop contains a 256GB Solid State Drive (SSD). To some users it may not be big enough to store all of their documents and multimedia files but it offers performance benefits in terms of having blazing fast boot times and launching programs quickly. We have always recommend our readers choose performance over storage. Users can always buy an external storage device like the Seagate Expansion 1TB portable external hard drive to make up for storage space. Also, if you run a lot of programs at once, it’s good to have a laptop that allows you to access everything at the push of a button, which is why it's 8GB memory will help you to multi-task and launch apps quickly. The memory can also be upgraded to 16GB if you heavily multi-task. Display, Graphics & Sound - The large 15.6 inch display is ideal for watching videos or playing games. It supports Full HD resolution of 1920x1080 pixels (TN-based Full HD panel) however, the laptop is non-touchscreen. The screen has a matte display that minimizes screen glare to provide a comfortable viewing experience. The display is advertised to have something called a blue light filter that is meant to reduce the blue light emitted by the laptop. Blue light is known to cause certain eye related conditions such as the risk of macular degeneration and retinal problems. We didn't see any noticeable difference but we also didn't have any headache or eye fatigue either. Overall, color reproduction was great and the image quality was quite good. Our only gripe is it's narrow viewing angles and the fact that it has to be angled just right to get a good image. The colors are massively distorted if you view the image at an angle sharper than 45 degrees up and down. However, considering the price we think we can live with this drawback. As for playing games, the laptop comes with an integrated Intel HD Graphics 520 GPU. The graphics is not meant for playing demanding games however, modern games (year 2015 and up) are playable at low settings and resolutions. Lastly, ASUS SonicMaster provides good sound quality from the built-in stereo speakers. The laptop has a deep bass output which hits every thump. Battery - ASUS F556UA-AS54 features a Li-Polymer battery that is advertised to have up to 700 charge cycles - 2.5 times more than Li-ion batteries. It retains nearly 80% of the original charge capacity to prevent deteriorating battery performance. Users can expect the battery to last anywhere between 5-6 hours with moderate use. Operating System - Windows 10. The ASUS F556UA-AS54 features a variety of connectivity options. There is a HDMI port, USB Type-C and 802.11ac wireless in addition to the standard USB 2.0 and USB 3.0 port (the laptop has one of each). USB Type-C is a new tiny physical connector that supports various exciting new USB standard like USB 3.1 and USB power delivery (USB PD). Apple’s new MacBook (MacBook MLH72LL/A) and Google’s new Chromebook Pixel (Pixel C1501W) both use USB Type-C ports as their charging ports. This could spell the end of all those proprietary laptop charging cables, with everything charging via a standard USB Type-C connection. It is nice to see ASUS adopting this new technology. In addition, there is a built-in memory media card reader to import/export your photos/videos from your digital camera, a VGA slot, Bluetooth 4.1, an optical drive (burner) and a front facing webcam (Non High Definition) on top of the display for basic video chatting/conferencing. The full sized keyboard with number pad is nice overall, however it is not backlit which is a disappointment. As for the trackpad, it's surface is plastic and it may take some time to get used to. We highly recommend using the ASUS Smart Gesture software (pre-installed) as it works really well providing excellent tracking, good gestures, and even some customized gestures from ASUS. The laptop measures 10.1 x 15.0 x 1.0 inches and weighs 5.1 pounds which makes it slightly bulkier than other common laptops. 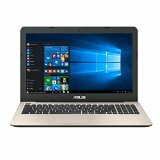 ASUS F556UA-AS54 has a lot to offer anyone looking for a reasonably priced laptop. The dual-core Intel Core i5 processor has enough processing power for tasks such as Word/Excel processing and web browsing, all the way to running photo/music/video editing software. However, we wouldn't recommend this as a primary gaming machine. 8GB of RAM and 256GB of SSD are major pluses that offer significant performance improvements. The screen while not perfect, is not bad to use and offers full HD resolution. Lastly, the variety of connectivity options will enable you to hook up just about any device to this laptop to help you finish any task you decide to take on. For the price, you almost cannot go wrong with the ASUS F556UA. We highly recommend this laptop to users looking for a laptop for home/office use at a reasonable price. For a slightly cheaper laptop with similar performance offered by the Intel Core i5 processor and SSD, we would recommend having a look at HP 15-AY013NR.